Location: Wongaling Beach Scottys Beach House has been chilling-out weary travellers for over 20 years. Scottys Mission Beach YHA is a large open plan backpacker resort in Wongaling Beach. We offer a range of rooms to cater for all types of travellers that are visiting Mission Beach. For travellers not looking to spend to much during their time in Mission Beach we have a range of twelve, six and four man dorms to cater for anyones budget. 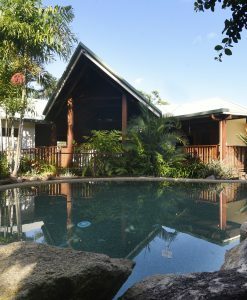 Sealords is a spacious, gracious and luxurious timber home set in landscaped gardens overlooking the coral sea, below the World Heritage listed Clump Mountain National Park. It is situated in a quiet street located near the heart of Mission Beach, only 4 minutes’ drive from a thriving tropical village.